'Blocks and Locks' stains, hides troublesome resinous bleeds and knots on hardwoods. 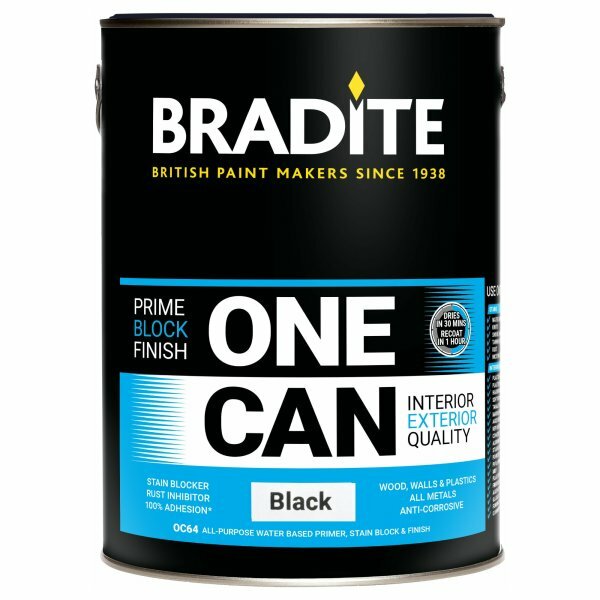 Bradite One Can is a single pack, low odour, quick drying, water thinned primer/finish coat with excellent stain blocking, adhesion and anti-corrosive properties. Ideal for protecting many substrates such as interior and exterior joinery, building plastics and metal surfaces. Can be used on the following stains: water damage, knots, smoke damage, tanin bleed, rust and nicotine stains. Bradite paints and coatings meet the highest quality and performance standards in the most demanding environments. To obtain satisfactory results you should ensure you know the best way to use the product. 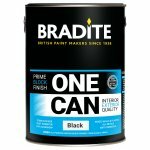 Free advice is available upon request from Bradite Paints and its distributors. General advice given below does not constitute a specification. Intact areas of existing coatings should, ideally, be roughened by manual or mechanical sanding. Feather back exposed areas to a sound coating edge. Cracks and pits should be filled using a suitable filler before painting. Substrate should be free of contamination, grease, oil, dust and completely dry before coating. For best results degrease using Bradite TD39 Industrial Degreaser. For full preparation and application details please see technical data sheet. Application and use should always conform with the codes of practice described in BS 6150 and BS 5493. Apply one or two further full coats as required. Touch dry in 30 minutes, recoat 1 hour minimum with full cure after 7 days. Tools should be cleaned with water after use.